March is an important month in Chicago's racing season. 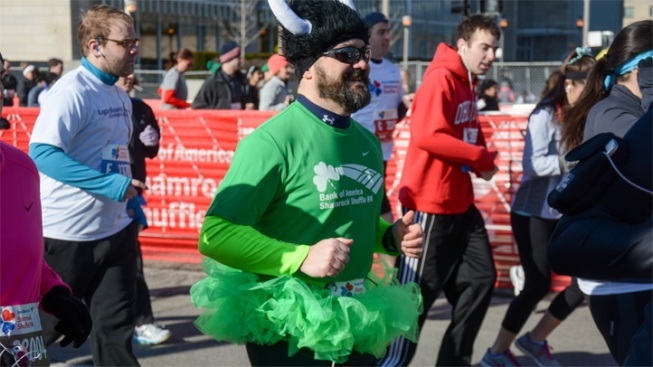 The Bank of America Shamruck Shuffle 8K marks the official start of the season, and a slew of St. Patrick's Day-themed fun runs precede it. Pick a few runs and start off the racing season right. Punk the Monk 5K Trail Run -- This fun trail run takes participants through the Lakewood Forest Preserve in Wauconda and has them chasing after a monk, as the name suggests. The course is approximately five kilometers, but race organizers say the total distance is closer to 3.5 miles.The race director wears a monk costume and runs the race with everyone else, but the participants who finish before him win a special "I Punked the Monk" award. The race takes place at 10 a.m. Saturday, March 7. Get Lucky Half Marathon and 7K -- In a city known for its Irish-American pride, the Get Lucky race is just one of many St. Patrick's Day-themed races in March. Runners can register for the half marathon, which starts on the Near South Side and ends in Jackson Park, or the 7K race, whose course snakes through Jackson Park. The half marathon starts at 9 a.m., and the 7K race starts at 9:30 a.m.
St. Paddy's Day 5K and 8K Run/Walk -- Now in its 15th year, this race puts runners in the spirit of the holiday with live music before and after the race and participants wearing green costumes. The course runs by the lakefront in Lincoln Park, and the race begins at 9:30 a.m.
Chicago Lakefront 50K George Cheung Memorial Race -- In memory of ultramarathoner George Cheung, participants in this race run three out-and-back sections of the lakefront path for a grand total of 50 miles. Although much of the trail is marked by gravel paths, it is one of the flattest 50K races on the continent. The race begins at 8:30 a.m. and has a seven-hour time limit. An early start option is also available. Green Beer 5K -- Thousands of runners and walkers will converge on Soldier Field to celebrate St. Patrick's Day with some cardio followed by green beer and music. Runners only get one free beer, but additional beer will be available to buy. The race starts at 9 a.m.
Bank of America Shamrock Shuffle 8K -- Finally, the race that unofficially begins outdoor racing season in Chicago is the Shamrock Shuffle. The race is the third largest in the Chicago area and the largest 8K race in the world. Celebrate St. Patrick's Day one last time and join 40,000 runners in Grant Park to kick off racing season.